Since safety-oriented product development is characterized by particularly challenging conditions, namely high costs and a somewhat small sales potential, finding a way to ensure long-term investment viability is an absolute imperative for system and product manufacturers within this market segment. Investment protection depends on various parameters: the availability and reliability of the hardware and software that is used, a safe legal basis for their use, and, of course, the scope and proper budgetability of development costs. 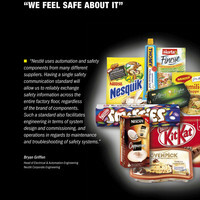 openSAFETY is a safe choice in every respect for product manufacturers and end users. 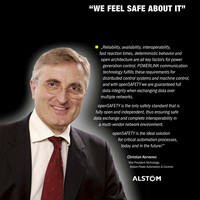 This solution gives them a ready-to-use safety stack with a proven track record of many years in actual applications. 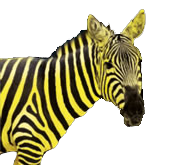 In contrast to dedicated, proprietary devel­opments, there are no high development costs for this solution, no lengthy periods of time must be spent on it, and no demanding know-how requirements must be met. 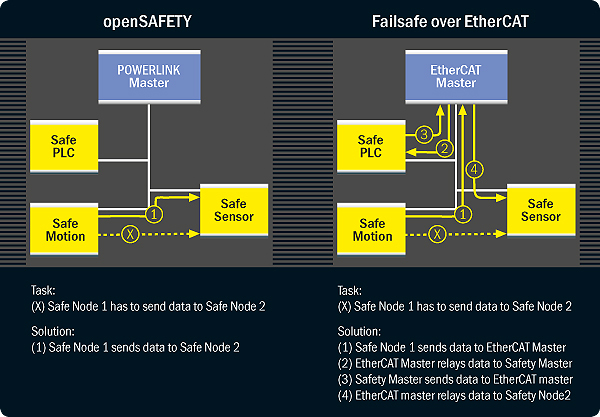 As it is already TÜV-certified and incorporated into the IEC 61784-3 standard, openSAFETY also minimizes development risks. Last not least, users also enjoy an extremely sound legal basis for long-term investment viability, since openSAFETY has been made available under the BSD open source license. Cross-traffic enhances safety:A network featuring cross-traffic capability (pictured on the left) enables direct node-to-node communication for safety devices, whereas, by contrast, communi­cation in a network that does not feature cross-traffic (see right side) must always go through Master and Safety Master nodes. In the latter case, signal transfer times are quadrupled, and an emergency stop is delayed.